Sail the seas with the Crystal Symphony, a classic luxury cruise ship. Best cruise deals only on Dreamlines.com. Though the ship recently celebrated its 20th birthday, the Crystal Symphony hasn’t aged a bit. Regular renovations and thoughtful design have kept it on-par with the latest standards in luxury cruising, and it remains one of the most popular luxury cruise ships to date. Sophisticated individuals who are interested in cruising unique locations with an exceptional level of comfort will feel at home on this ship, as will mature couples celebrating a special milestone. One of the most striking features of the Crystal Symphony is its excellent service. Service staff are trained to be friendly, attentive and polite. They’ll remember your name and your dining preferences, and do their best to anticipate your every need. The staff strike the perfect balance of formality and friendliness: the white gloves and attention to detail are sure to please even the pickiest of cruise passengers, and the friendly smiles and cheerful conversation will make you feel at home from day one. The staterooms were the most recent element of the Crystal Symphony to undergo renovation, and with fantastic results. 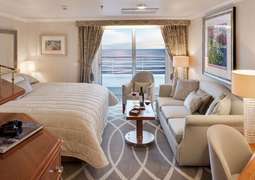 Now with new linens, updated appliances and a sleek new design, the staterooms look more at home in a five-star hotel than on an ocean liner. 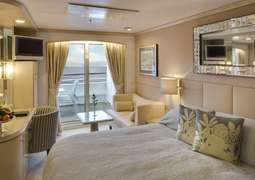 All staterooms have an ocean view, and 65% have a verandah. But the true stars of the show are the luxury penthouse suites. Crystal suites features a walk-in closet, whirlpool tub and a roomy shower. Guests can enjoy panoramic ocean views, flatscreen TVs in the bedroom and the bathroom, all-inclusive in-suite dining and complimentary refreshments at different points in the cruise. Paired with a personal butler service, a stay in a penthouse suite is a dream come true. Crystal cruises knows what to keep and what should stay the same. The crowd pleasing specialty restaurants Prego and Silk Road are back, serving up gourmet Italian and Japanese fare. The Crystal Dining Room has an updated menu to include lighter, healthier options than before. And the exquisite level of service is maintained, with the highly-trained wait staff remembering each diner’s preference – even from previous cruises. The Crystal Symphony offers the perfect blend of traditional and modern on-board activities. Entertainment options include traditional cruise favorites such as comedy shows and wine tastings. Educational programs are particularly popular, with passengers enjoying informative lectures, hands-on workshops and art classes, and the “Computer University @ Sea” classes are often completely full. The onboard tennis court is a major hit, and cruise veterans will not miss the pool with jacuzzi, on-board shopping and numerous bars and lounges. The dress code aboard the Crystal Symphony is daytime casual, evening formal. After 6 p.m. on most nights, passengers dress smart casual or slightly formal. Women tend to wear slacks, skirts or dresses, while men wear buttoned shirts, collared shirts and slacks. On formal nights, the dress code is black tie optional, meaning anything from dressy evening wear to extravagant ball gowns and tuxes. Launched in 1995, this sleek and elegant ship has all the characteristics of a luxury ocean liners – full of exciting activities, fine dining, and exquisitely-appointed staterooms. Onboard amenities include a lavish spa, grand lounges, expansive decks and award-winning entertainment Crystal Symphony, owned and operated by Crystal Cruises, finds a natural home in the world’s most glamorous ports of call. Many cruise itineraries with the Symphony from point to point can be booked sequentially for a longer trip with unique ports of call such as Quebec City, Cape Town, Port Louis and many more. Crystal Symphony is designed to impress you! Crystal Symphony – embrace the sea! Take a deep breath, relax and begin to enjoy your opulent cruising experience. Onboard the Crystal Symphony there is something for everyone. There is a rich variety of luxurious wellness treatments in the Crystal Spa & Salon allowing you to slip away from the stresses of daily life, as well as a chance to enjoy some of the rejuvenating services such as Aroma Stone Therapy, Japanese Silk Booster Facial, and Well-Being Massages. For the sportier guests there is also a paddle tennis court, 2swimming pools to choose from and a superbly equipped fitness area to keep your heart pumping. On the Crystal Symphony you are spoilt for choice in what food you decide to eat. There is a number of eateries including the Silk Road, which showcases Asian dinner-only in an oriental style setting, the Crystal, which features a gourmet menu with regionally inspired and traditional dishes. If you feel like upscale Mediterranean, head to Prego for mouth-watering ravioli and veal rib eye steak. There are also more informal and fast food restaurants which are more suitable for relaxed afternoon snacks including the Trident Bar & Grill, and the Lido Café.